The Thermax CP5 is an industry proven performer, built to endure the most demanding carpet and upholstery extraction cleaning applications. Constructed in a portable footprint easily operated by one individual, the CP5 is designed to attain the highest level of professional cleaning results! Powerful two-stage vacuum motor for increased recovery speed and quicker drying time (112" water lift). Built-in 1800/300 watt dual solution heating system for uniform temperature control (up to 175°). 5-Gallon hygienic stainless steel solution and recovery tanks. High-impact, chemical resistant housing with conditional lifetime warranty - virtually indestructible. 60 psi high-efficiency demand solution pump. Multi-option wand and hose packages for vacuum and extraction versatility. 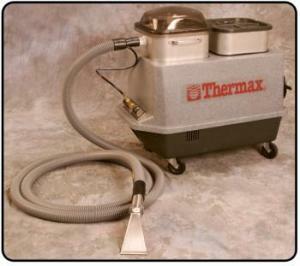 The Thermax CP5 is a versatile machine that cleans vehicle interiors better than any other system. It deep cleans interiors blasting away dirt, grime and odors leaving the interior fresh and clean! The power and efficiency of the Thermax CP5 makes cleaning carpets and upholstery in your home or office a real pleasure. 7) Secondary filter responsible for only 3% & is before motor. It is reusible 7) Secondary filter is responsible for 25% of dust that escapes water & is placed after the motor causing it to overheat.